The tiny Czech studio responsible for Samorost has always produced visually compelling games. But the cult freeware favorite and its sequel mixed cute but simple flash cartoons with re-purposed photography, and Amanita Design promised to up the ante for its feature-length debut, welcoming artist Adolf Lachman and animator Jara Plachy to the team. 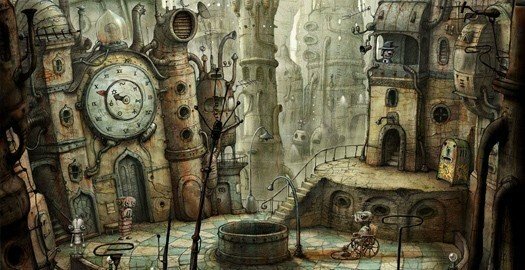 The outcome: Machinarium, a painterly dreamland of rusting metal and machinery, intricate detail and implausibly picturesque structures, all done using a muted colour palette and woven out of living concept art. 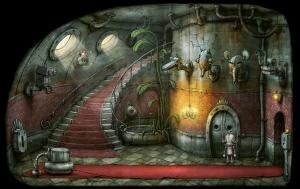 Each new background in Machinarium is a tantalizing reward for progress; each robot design perfectly evokes its distinctive character. And it’s all done wordlessly. Here the graphics not only provide the eye-candy, but drive the narrative as well, allowing pictures to tell their own stories that no amount of words could do as well. Better yet, the presentation doesn't obstruct the gameplay – there's no pixel hunting here, as every tiny button on the wall or collectable object is laid out with natural clarity. To cram so many visual wonders into every corner of a game takes a particularly deft touch, and Amanita has demonstrated that in abundance. How often do you see some concept art for a game and wish the finished version actually looked like that? The raw design art is less polished but more human, less managed but more natural. In Machinarium, that’s exactly what we get, and clearly we all loved it. It’s dirty, it’s grimy, it’s broken down and decrepit, it’s nearly monochromatic and looks like a pencil sketch… and it trounced all opposition for the best looking game all year.